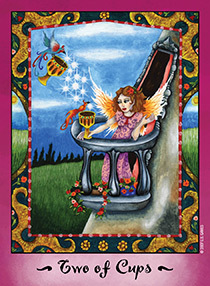 Although the book readings and traditional two of cups are about love and partnership, this card strikes me as lonely. The woman is sitting in her tower with a bird for company. The look on her face is sad and very bleak. this card kind of sums up how lonely I feel lately. I am very lonely and I feel like the good stuff is passing me by. I feel like all I do is work. I'm realizing this card isn't lonely as much as showing a need to let people in and let ourselves be cared for by others even if those others don't appear to be what we're looking for. I think the message from the universe is about having people and beings in our lives who recognize our pain and who are there for us when we need them The little critters are there to cheer her up and to bring stardust into her life. This card is about people who love you showing up for you. When I look at the card i this context, I do have people who love me and who show up for me when I need them. The kids are always there for me, Clark shows up and cuddles and makes me laugh. People at work are supportive of what I'm trying to accomplish. Even though I don't have the love of my life, I am loved and supported.